Size: 5.2" x 2.8" x 0.9"
You are familiar with this Bohsei 3000 calculator? You are right, this calculator - and the sibblings named Academy, academy memory, Alltronic HK 9805, Bowmar, Cetina ET, Comico 1000, GPM 15, Gracia, Harvard Student H-303, Janon 3000, King Sonic 3000, MBO 3000, Nikjan, Nobility 3000, Noris 3000, Planar Memory, Realtronic, Seneca 1000 and Tronica 3000 - are a nearly perfect copy of the TI-1250. 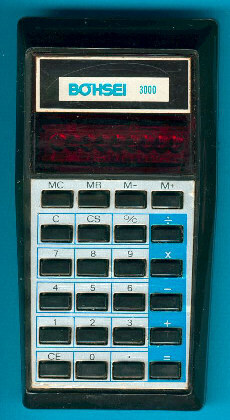 Within the Datamath Calculator Museum we refer this calculator as Far East Generic Design I, probably the cheapest calculator of the 1970s. Don't miss the Design II and Design III.